How has video and film room technology changed the way college football is played and coached? Todd McCarthy began his career as Georgia Tech’s director of video operations in 1998, and he remembers a time when sharing film with other teams wasn’t so easy. In those days the Yellow Jackets—like most programs—physically swapped film on Betacam tape. That involved a lot of work from McCarthy and his staff. Almost two decades later, the digital age has drastically altered the way McCarthy and other video crews work in college football. Modern film technology has made sharing and studying video easier than ever before: Teams share film instantly via the Internet, while coaches and players can access video minutes after practices and games end. Meanwhile, new digital technology awaits, developments that could continue to shape how college football is played and coached. Georgia Tech uses video-editing software called DVSport, the same program used by NCAA officiating crews for high-definition instant replay in the Power Five leagues. McCarthy and his staff used to spend three or four hours editing film after every practice, which meant coaches had no choice but to wait. Now, McCarthy has film prepared for coaches a mere five minutes after practice ends. In 1998 Georgia Tech and Florida State became the first ACC schools to move to a digital video system, called Avid. Since then the Yellow Jackets have gone from having little semblance of an in-house network to a current crop of 40 computers. Georgia Tech’s video team doesn’t even use physical DVDs anymore; instead, it operates entirely on digital- and cloud-based platforms. McCarthy estimates digital technology saves him 40 to 50 hours of work per week. The ease with which players and coaches access film extends beyond the practice facility. Georgia Tech’s DVSport software includes an app called Shuttle, which allows players and coaches to access team video on their personal laptop, tablet or smartphone. NCAA rules limit players to 20 hours of athletic activities per week, but that number does not include voluntary time, such as watching film at home. Since players are no longer forced to visit practice facilities to watch tape, many teams now expect them to sneak in extra film study during their free time. At Tennessee, Harrington says players usually split time between film study in the practice facility and at home. According to McCarthy, however, most Georgia Tech players break down film on their personal devices. “It’s become, ‘Hey, I’ve got 20 minutes between class and I’m sitting in the courtyard, so I’ll get on Georgia Tech’s Wi-Fi and watch some Virginia film,’” McCarthy says. Vanderbilt head coach Derek Mason saw the impact of film technology firsthand during his stint as Stanford’s defensive coordinator. A former Cardinal kicker, Derek Belch, is the founder of STRIVR Labs and one of the pioneers of virtual reality in college football. Stanford head coach David Shaw encourages his players to keep coaches updated on new technology. If players hear of something interesting in the classroom that could be folded into football, Shaw wants to know. Mason brought that same mindset to Vanderbilt, where he ordered the purchase of iPads for his players not long after his arrival in January 2014. The Commodores’ iPads include a scheduling app called Team Works, which lets coaches update players’ itineraries and send team-wide messages. Vandy isn’t the only school to use iPads; Tennessee players also receive them upon their arrival on campus. McCarthy says Georgia Tech is considering a similar strategy. 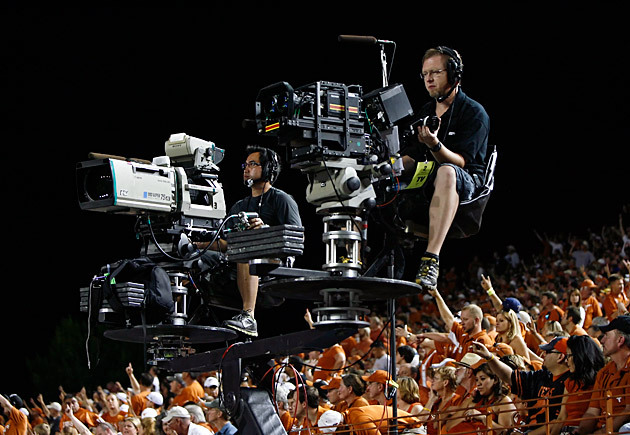 Film technology could soon become an even bigger part of in-game situations in college football. This February the NCAA Football Rules Committee announced it would explore the increased use of technology within the game. That includes the use of computers and tablets to watch instant replays and diagram plays in the team bench area, coaching booths and locker rooms. Current NCAA rules limit the use of tablets or computers in the team bench area or coaching booths to medical personnel in need of player safety information. Air Force coach Troy Calhoun, chair of the Rules Committee, said the committee would prefer “controlled experimentation” on the issue. Experimenting could take place during the 2015 bowl season and be implemented as soon as the ’16 season. A number of other video developments could come down the road. The use of drones remains an intriguing topic across college football; some coaches, like UCLA’s Jim Mora, use drone cameras to film practice. Other programs embed cameras in players’ helmets. Harrington says Tennessee has placed cameras in quarterbacks’ helmets, as well as in those of defensive players. The Football Rules Committee is even considering the use of helmet cameras during games, both for coaching and broadcast purposes. To a college football coach, time saved in the video room is time gained over an opponent. Coaches and players study film when the video team makes it available. McCarthy notes that when Georgia Tech and Florida State pioneered digital video technology in the ACC in 1998, they tied for the conference title that season. He doesn’t think that was a coincidence. Seventeen years later, film technology remains a rapidly changing component of the sport.